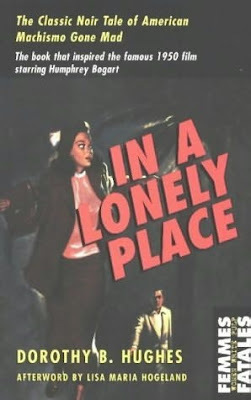 Skimming the shelves of the British Film Institute bookstore, I saw a familiar book: In a Lonely Place by Dorothy B. Hughes. The 1950 movie starring Humphrey Bogart and Gloria Grahame is probably more well known than the book but I wouldn't have known either had I not worked for the Feminist Press. During my days as the marketing associate for the publisher, one of my tasks was to sell this book. It was part of the new Femmes Fatales series and I was supposed to pitch it at conferences and to schools and bookstores. The pulp series debuted shortly before my time at the Press came to a staggering halt and by then I knew I was no saleslady. If I'm not REALLY excited about something, I can't fake it. And even when I am really excited, I still kind of think it's up to everyone to decide for themselves what they like and don't like, what they need. Mine is not the Salesperson of the Year attitude. "Oh, you don't care? That's cool, wanna talk about something else?" I liked coordinating events and readings and wanted to talk to people without sales figures getting between us. At the British Film Institute I was happy to see In a Lonely Place on the shelf and thought the possible implications were swell, that the Feminist Press is doing well and hasn't backslid into dry academia and at the very least the pulps, by far the most titillating titles on the list, have made it across the Atlantic. But I was beyond relieved to have nothing to do with it anymore. I started working with books out of lust for letters and ideas. Had I carved out an editorial space for myself in publishing, maybe that energy wouldn't have been gobbled up by trying to sell other people's ideas and wondering what font they used on that cover. I tried to salvage time while working in publishing to linger over what books said inside but I was burnt. Forget about what I had to say inside. So I plucked In a Lonely Place off the shelf and flipped it around in my hand, then put it back and kept wandering around London's South Bank, grinning. Because with my touring work now, I do sometimes actually find the space to relish letters and all the ideas that they spell out.